Is the Boss RC-30 the holy grail of loop pedals? Out of the box, the RC-30 is surprisingly smaller than expected, which is certainly a good thing. 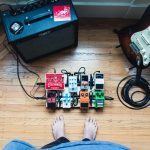 If you’re building a pedal board and want to include some form of a looper pedal (which you should), size is often an incredibly limiting factor and many looper pedals can be notoriously bulky, so it’s nice to see that size has been taken into consideration. One of the defining features of the RC-30 is the twin pedal integration, offering untold possibilities for every type of player, whether you’re a busker looking to expand your one man band, to a guitarist practicing at home that wants to experiment with looping. The twin pedal simply means that the RC-30 is a multitrack looper, capable of recording and ‘stacking’ stereo loops without compromising in audio quality. This dual looping aspect also means that you’re given a greater degree of control over how each individual looping patch is managed, as the controls on the pedal can be used uniquely for each loop. This also includes controlling the volume of each track with a handy slider, and a very clear ‘select’ button which highlights in red the track that is currently live. It’s easy to see how this feature can be handy when playing in a live environment, as the markings on the pedal are very clear. 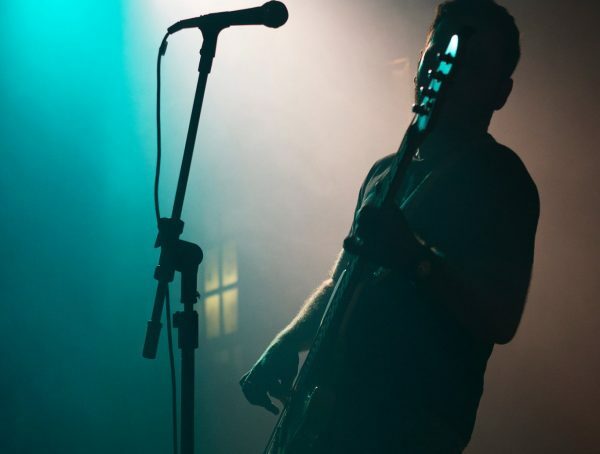 Our personal favourite is the lo-fi setting, which adds a filter-esque blanket effect to the loops and allows for soloing or noodling over the top of the track. You know when you go swimming and get water in your ears? That’s the effect! The sheer amount of recording time is why many gigging musicians and recording artists flock to this pedal. At around three hours of solid recording time, and the ability to store and retrieve patches, it’s easy to see how this pedal can become your go-to for quickly recording song ideas and riffs you’ll need to recall later on. And whilst we’re on the topic of memory, the pedal comes with a whopping 99 patches for you to save and secure loops. If you’re a fan of the RC-3, you’ll love this next feature… Auto record on all instruments plugged in to the looper! What we’re seeing is that many live looping guitarists require the ability to auto record and layer loops with ease, which was a sloppier feature of the RC-3. The RC-30, however, has fully addressed concerns.. We’ve tried it with a keyboard, a mic, and obviously a guitar, and the auto record feature is seamless. And, whilst we’re on the subject of using mic’s, it’s clear to say why artists such as Ed Sheeran would rely on this pedal to record beatboxing and vocal loops. The pedal comes with an XLR input, or if you’re wanting to use a condenser microphone then phantom power input is also an option. The mic feature also tempts you to push the creative boundaries of looping. Ever wondered what a loop with the sound of your snoring dog would sound like? Us neither, but the point is… you can! Just point the mic and what you want to loop and record away. As is common with all loop pedals in the Boss series, the RC-30 comes with an increasingly well thought out range of drum loops, lovingly referred to as ‘rhythm guides’. Whether you want to use a drum loop or not is up to you, however this feature really shines when wanting to experiment as you can set a tempo by simply tapping the ‘tap tempo’ light. 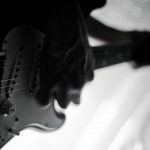 What is also good is that the tempo is then stored and saved, so you can plug in at the following practice and start straight from where you left off. You can also save and export any patches via the very handy USB port (saving patches of over 1GB), great for taking loop ideas on the road and having an external storage device just incase something happens to your loop pedal. If you already have loops from an external storage device, then that’s okay. The pedal also has an AUX port so whether you have old loops stored on a CD player, or via another looper, it’s so easy to just connect and play. As is common with Boss pedals, the build quality is very sturdy and we have no issues. Boss have thought about all types of guitarists with the option of batteries or an AC power supply. 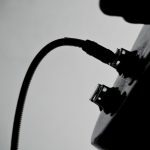 Changing batteries is also much easier than compared to the smaller RC-3 and the smaller pedals in the Boss range, however we’d recommend sticking to the power supply so that you’re not spending a fortune in batteries. Take a look at the below demo to see the RC-30 in action, including how the various settings can be fiddled and tweaked to make the looper do exactly what you’re looking for! 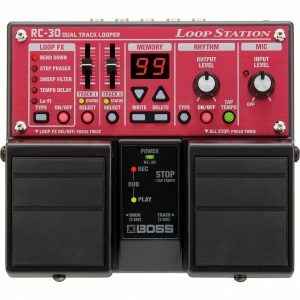 The RC-30 is the perfect middle ground between a heavy-duty looper, and a run of the mill loop station. The number of options along with the memory capabilities of the pedal are simply staggering for the price, with a very slight learning curve but nothing too bad for beginners. Limitless capabilities in terms of settings, effects and storage. Very fair price point considering the amount that can be done. The pedal is both light and tough, great for travelling and gigging guitarists. 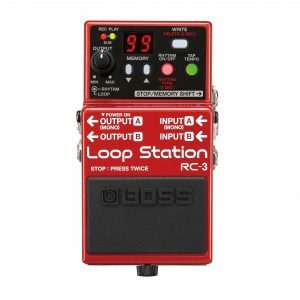 We would still recommend the RC-3 as it’s slightly cheaper therefore the investment isn’t as high if you’re only looking to dip your feet into the world of looping, but still want a pedal with numerous settings and capabilities. Many players will consider the pedal to be too bulky, purely based on the size in comparison to the RC-3. Is this the pedal that Ed Sheeran uses? Ed Sheeran is known to fluctuate between loop pedals, commonly using the RC-30 and the RC-300. However, at this stage, it is wise to suspect he hast custom models tweaked based on the current Boss ranges. 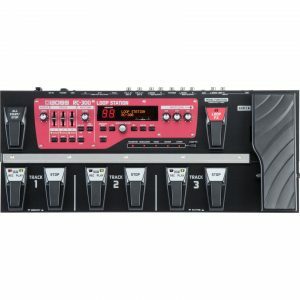 Is this a good loop pedal for busking? Yes! 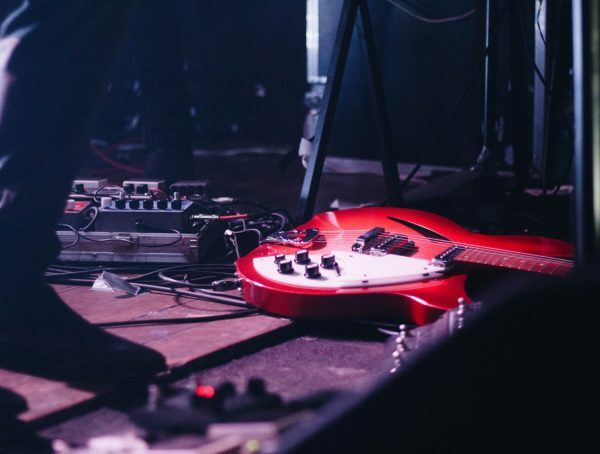 The price and features along should justify the purchase, however we would not recommend the pedal for guitarists who don’t have a lot of space in their pedal board. 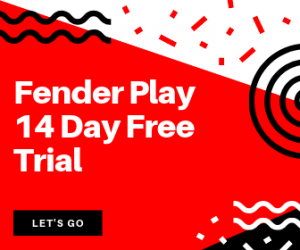 It is however great for singers, keyboardists, and literally any kind of instrument that can be relayed through the looper… The possibilities are endless. 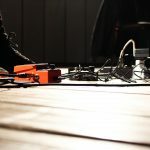 Is this a loop pedal for beginners? There are really two answers to this questions, depending on a couple of factors. We would say yes it’s a pedal for beginners based on a short learning curve, memory limit ad features, however we would say no if you’re not wiling ti invest a pedal that you’re not going to use. Not had enough of our writings on the world of the looper? Check out our complete guide to loop pedals here.